When we experience the religious rituals of the “other,” we usually cannot help but respond with an internal running commentary, seeking connections to our own past. 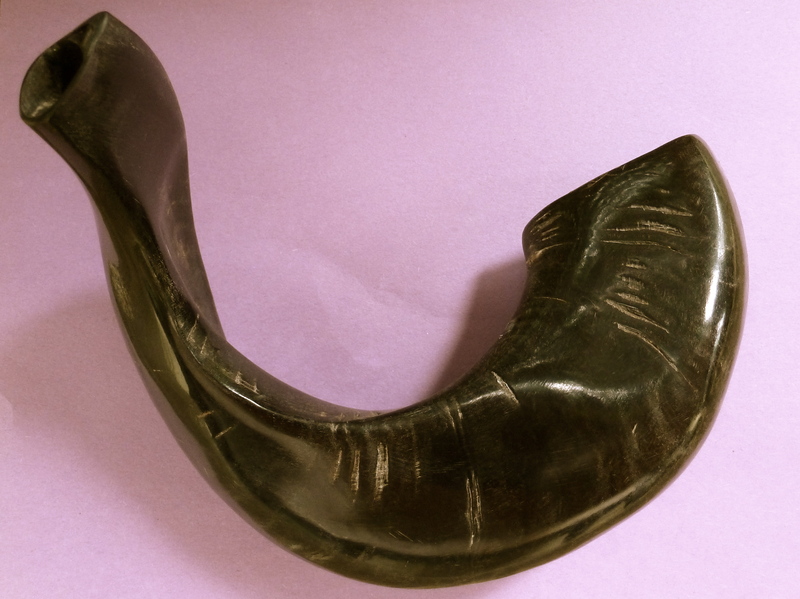 I know that whenever I heard the blast of a conch shell at an Afro-Brazilian rite during my years in Brazil, my mind would skip back to the sound of the shofar in my childhood temple. On Rosh Hashanah and Yom Kippur, many Christians (and Muslims, Hindus, Buddhists, atheists) find themselves attending services with Jewish partners, or parents, or other family members. These services, while tremendously important to Jews, can be difficult for those without Jewish education to access, due to length, solemnity, and the density of Hebrew. Nevertheless, I always strongly recommend that those of other religions accompany their Jewish partners or parents to synagogue services, both to keep them from feeling lonely, and to learn and reflect. Birth of Three Faiths. On Rosh Hashanah, the Torah reading describes the arrival of Abraham’s two sons: Sarah gives birth to Isaac, Hagar gives birth to Ishmael. Sarah becomes the matriarch of Judaism (and thus Christianity), Abraham sends Hagar into exile. But in Muslim writings, the heroic Hagar (Hajir) becomes the mother of Islam. Charlotte Gordon (an adult interfaith child) has written a sensitive analysis of the story of Hagar in her book The Woman Who Named God: Abraham’s Dilemma and the Birth of Three Faiths. Miracles. Sometimes Jewish students approach Rabbi White and assert, with a certain smugness, that Christianity requires belief in miracles and Judaism does not. The Rabbi points to the miracle of the birth of Isaac, when Abraham and Sarah are in deep old-age (Abraham is 100). Genesis specifies that Sarah not only has suffered from lifelong infertility, but is post-menopausal. Virgin birth, post-menopausal birth, both miracles. Songs and Canticles. The Biblical passage known as the Song of Hannah, a reading from the prophet Samuel, is the haftara reading chosen to complement the Torah reading on the first day of Rosh Hashanah. The infertile Hannah has prayed for and been given a son, and her song of Thanksgiving is thought to have inspired the most famous of all canticles in the Christian liturgy, the Song of Mary, known as the Magnificat. Finding a welcoming service, getting off work, arranging childcare, sitting through services, fasting, gleaning meaning from ancient prayers in an unfamiliar language: none of this is easy. But it is excellent experiential education for anyone connected to Judaism through family ties. For Jews, having the support of a partner in these days of deep reflection and soul-searching, of repentance and renewal, provides comfort and bonding. For interfaith children, having both parents sitting with them at services provides a clear message of respect and appreciation and love, by the parents for each other, and for the children, and for ancient ritual. Susan Katz Miller is the author of Being Both: Embracing Two Religions in One Interfaith Family, from Beacon Press. She works as an interfaith families consultant, speaker, and coach. Follow her on twitter @SusanKatzMiller. The solar Gregorian calendar determines the timing of Christian holidays, while both the sun and moon guide the Jewish calendar. As a result, each year interfaith families must choreograph the dance of Hanukkah and Christmas in a new way. In 2016, this dance will require some expert steps, since the first night of Hanukkah falls on Christmas Eve. Don’t forget Hanukkah on Christmas Eve. If you are traveling, remember to pack the Hanukkah menorah. In the excitement of Christmas Eve, don’t forget to set aside a few minutes to gather everyone and actually light the first candle. Enjoy the synergy of a glowing Hanukkah menorah and a sparkling tree, and talk about the common theme of light at the darkest time of year. Safety tip: If you are going off to a mass or church service, be sure to light candles when they will have time to safely burn down. Postpone Hanukkah gifts. On Christmas day, lean into Christmas. After a full day of Christmas and stacks of presents, do remember to light candles for the second night. But consider putting off Hanukkah gifts until later in the week. In fact, resist the false competition between the holidays that has given rise to the whole idea of Hanukkah gifts. Tell the Hanukkah story. Emphasizing the religious freedom angle in the Hanukkah story is a perfect activity this year. We are lucky to live in a time and place with the freedom to celebrate either, or both, or any religion. Singing the Hanukkah song Rock of Ages (different from the Christian hymn of the same name) in English rather than Hebrew on the nights you celebrate with extended Christian family members will make the story more accessible. Give to others. Once Christmas has ended, lean into Hanukkah. The middle nights of Hanukkah would be perfect for giving back, in lieu of more family gifts. Stress that both holidays encourage us to care for those in need. Engage children in deciding what causes they want to support with charitable donations this year. Organise acts of service. Christmas encourages empathy for those who, like Mary and Joseph, must travel and seek shelter. Hanukkah provides an opportunity to talk about how Jewish history compels us to work to promote social justice. Celebrating these intertwined themes by engaging in acts of service together to support refugees and religious minorities. Give Hanukkah gifts at the end. If your family does give Hanukkah gifts, wait until the end of the week when the novelty of Christmas gifts has worn off. Some families like to emphasize books and clothes as Hanukkah gifts for children, rather than toys, to further differentiate the two holidays. Time the parties. Hanukkah spans two weekends this year, and Christmas sits squarely on the first weekend. So the second weekend could be a good time for a Hanukkah party. Try a party on Friday night with the festive lighting of both Shabbat and Hanukkah candles. Or, plan a family New Year’s Eve party with the lighting of havdalah candles for the close of Shabbat, followed by Hanukkah candles. Or, arrange an elegant adult New Year’s Eve party with caviar on latkes, champagne, and gambling with dreidels. Try not to stress. As you move through the dance of Hanukkah and Christmas this year, don’t fret over a misstep or two. Everyone forgets to light candles on occasion. Everyone has a relative who makes some awkward comment about interfaith families. Everyone has a different comfort level with where to place the Hanukkah menorah in relation to the tree. Through it all, do your best to stay in touch with a sense of holiday joy. While reporting my recent article in The Washington Post on Brookville’s Multifaith Campus on Long Island, I ended up with a lot of material that did not make it into the story. As an unofficial historian of the interfaith family communities movement, one of my goals is to record and preserve as much of our ongoing story as possible. Below, I share an extended interview with the minister at Brookville Church, Reverend Vicky Eastland. Here, she discusses her role as a Reformed Church in America minister, in the context of Brookville’s Multifaith Campus—a joint project of the Brookville Church, The New Synagogue of Long Island, the Muslim Reformed Movement Organization, and the Interfaith Family Community of Long Island. Susan Katz Miller (SKM): When the search committee first contacted you about coming to Brookville as the new pastor, the Interfaith Community already had a close relationship with the church there. What was your first impression of this relationship? Rev. Vicky Eastland (VE): Initially, one of the reasons Brookville was interested in me was because I was one of the founding members of an interfaith council in upstate New York where I was pastoring a church at the time: we met to do community service and events together. When I heard the word interfaith, that’s what I thought of. It wasn’t until I received a series of questions the church wanted me to answer on paper that I realized it was about interfaith families. I still had no idea what this interfaith families community was, that was connected to the church. SKM: I know Pam Gawley (co-founder with Sarah Cirker of the Interfaith Community of Long Island) has said she may be the only Jewish woman to serve on a church search committee for a new pastor. VE: When I showed up for my second interview, I was really quite surprised because the search team of the church stepped aside and let Pam and Sarah lead the interview. It ended up being a great experience for all of us. I remember one of the search team members saying something that has stayed with me: “We’re not just looking for the next pastor, we’re looking for someone to take us further in our relationship with the Interfaith Community.” This was an integral part of helping them decide who the next pastor would be. SKM: The Interfaith Community of Long Island, which was founded to support Jewish and Christian interfaith families, now holds their interfaith Sunday School at Brookville, and these interfaith families attend the church service at Brookville on a specific Sunday each month, as part of their interfaith education program. Do the theological differences between Judaism and Christianity pose a challenge for you in those services? VE: The most challenging aspect for me since I’ve been at Brookville is surrounding the Sacrament of Communion. Personally, I don’t think we should turn anyone away from an experience with God, so I understand opening the communion table to non-Christians. But the wording in the Reformed Church in America (RCA) liturgy is very Christocentric. I was using that liturgy, and I had a Catholic woman ask me, “Can you please not use those words? My husband who is Jewish feels like all Christians are blaming him for the crucifixion of Christ.” There were Sundays when I left the service, and I started crying because I felt like something I said was offensive to someone from IFC. But then there was pushback from other Christians who were saying, “We don’t want you to take those words out.” But for a while I did, because I don’t think anything should be excluding people who want to be there. In my second year, we moved IFC Sunday to a non-communion Sunday, and I’ve gone back to the RCA language for communion. Pam Gawley, who is Jewish, told me, “We want this to be authentically Christian.” We’re all on this journey together. And the Catholic woman who was worried about how her Jewish husband feels? That husband actually participates now in communion. Last Sunday was Easter Sunday. I was very Christocentric in my sermon–but its hard not to be on Resurrection Sunday. That cognitive dissonance that I had in the first year, I don’t have so much anymore. In the service I said, “I know there are people who are with us today that aren’t Christian, and don’t believe what we’re saying here, and that’s okay.” A Jewish mom came up to me afterwards in tears, and said she was so moved to be acknowledged. It was not planned: it just came out of me. SKM: I know the Muslim study group had been meeting at Brookville Church on Sunday afternoons for many years, but how did it become integrated into the Multifaith Campus? VE: When I got there in the fall of 2013, I realized the rabbi, Rabbi Stuart Paris, had never met the Muslim leader, Dr. Sultan Abdulhameed. I started doing introductions, friendships formed, and we realized our individual missions were so similar–we all wanted to bring reform to our specific faiths. None of our groups is exclusive, anyone is welcome at any of the groups. Then we said let’s do something together, around a holiday not based on any of our faiths. That first Thanksgiving together was the highlight of my entire ministry career. We started out with our new Brookville Multifaith Campus sign dedication, on the lawn of the church. One of the members from the Muslim community did the call to prayer in Arabic outside on the PA system. We had about 200 people, the maximum we can fit into the chapel, and there wasn’t a dry eye. Dr. Sultan said he’d been to a lot of these interfaith Thanksgiving services where the representatives each preach from their own holy scripture, and it feels almost like a competitive situation. So he suggested that instead we preach from each other’s holy scriptures. I ended up preaching from the Quran, Dr Sultan from the Torah, and Rabbi Stuart from the New Testament. That’s what we’ve done ever since—this year was our third Thanksgiving together. Since that first Thanksgiving, I have traveled to the Sultanate of Oman, a Muslim majority nation in the Middle East , and I have had a lot more exposure to the Muslim faith. The Quran has come alive to me in ways I never would have imagined. We’ve been talking with the IFC about how to add an Islamic unit to the interfaith Sunday School curriculum. For now, we’ve decided to wait until there are more young Muslim interfaith families in the IFC community. SKM: As the Brookville Multifaith Campus becomes established, do you see this as a template for other communities? VE: We’re now at the point where I’m starting to form a team with people from members of all four communities, to work on becoming a 501c3 (non-profit institution). The long-range hope is that that this will turn into a model that will change the makeup of our church. I believe that’s the direction all houses of faith should move in. I think it’s a model that everyone should look at. Many churches, here and across the country, have been shrinking, even closing. Recently, I met with a group of clergy from Long Island. They came to learn about what we’re doing–how it’s working, why it’s working, and what we’re doing that’s making it so successful. We all need to wake up and realize that we’re becoming a more integrated society. How is that going to play out in our houses of faith? Clergy can no longer bury their heads in the sand and pretend that the needs of interfaith families are not important. We have to find ways to meet their spiritual needs. Ours is a model that others can follow. Susan Katz Miller is the author of Being Both: Embracing Two Religions in One Interfaith Family, from Beacon Press. She works as an interfaith families consultant, speaker, and coach. Follow her on twitter @beingboth. I want to give a thorough response to a recent Washington Post blog post (printed in today’s edition of the paper) entitled, “Not what I expected from my interfaith marriage.” The piece re-enforces some misconceptions about why parents choose to raise children with both religious traditions. In short, raising kids with both religions does not mean they will always claim “both” as a lifelong identity. Nor should it. The author, Susan Sommercamp, states that she and her (former) husband wanted to share both traditions and “thought” their children could be “both,” but that “unfortunately things don’t always go as planned.” The big reveal in the piece is that one daughter chose to practice Christianity, while the other daughter chose to practice Judaism. From my perspective, having children choose two different religions is not an unfortunate or surprising result. It’s a typical result. And there’s absolutely nothing wrong with it. Second, as a corollary, raising children with both traditions cannot have the goal for children to become, and stay, religiously both. Some will, and some won’t. As documented in Being Both, some will choose one religion, or the other, or both, or none, or a new religion. And the choice may not be permanent. Pew Research has found that some half of all Americans change their religious affiliation at least once. The benefits of educating children in both family religions include allowing them to make more informed religious decisions, and allowing them to feel a connection and support from both sides of the extended family, and giving them bi-religious literacy. Not fixing them permanently in a “both” identity. There were unfortunate aspects of this family story, but they do not stem, in my estimation, from the initial decision to raise the children with both religions. Of course it was unfortunate that the couple divorced, and that the children may have felt a competition between the parents (and parental religions) as a result. It was unfortunate that (partly as a result of the divorce) the two religions were each celebrated with only one parent, and without the support of an interfaith families community, so that the parents and children did not have a way to discuss and integrate their identities in a neutral and supportive space. And while the author claims in the first paragraph that the couple had agreed to share both “faiths and heritages,” she admits that she took them to synagogue and Jewish religious education, and felt “surprise and some disappointment” when her husband begins taking them to church. In reality, she was attempting to raise them solely with Judaism, plus some holiday celebrations, not with full exposure to both. It is only after the divorce that she tersely accepts a sort of “separate but equal” exposure to both religions. So this family’s experience in no way reflects “doing both” in the context of good communication between the parents and full dual-faith religious education. Ultimately, despite the divorce and initial tension as the two daughters claimed their religious identities, the author concludes that “we are all more tolerant and understanding because of our messy interfaith family.” It is interesting to note that Sommercamp saw the benefit of being an interfaith family, even after the difficulty of divorce. But those of us who raise our children with both religions with the intention of letting them go, of letting them claim the practices and identities and affiliations most meaningful to them, would never use the word “tolerant” in this context. The goal is not to tolerate each other, but to embrace each other, and embrace the religious choices of everyone in the family. 1. How would you describe your own religious family history and journey? I grew up in a mixed religious family, Jewish and Christian, both practicing. My parents embraced the tension, encouraged me to experience both ritualistic worlds, find my own place of commitment and conviction. Living overseas in Germany, we attended the Unitarische Freie Religionsgemeinde, a free-religious community that served mixed families like our own, some Muslim-Christian, others cross-cultural in non-religious ways. As a teenager, I was “religious but not spiritual,” in the sense that I attended services but didn’t necessarily identify with the beliefs and practices in an intimate and immediate way. However, in my last years of high school, all of that changed during a particularly difficult struggle with chronic illness. I was stretched and shoved to my physical and spiritual limits, and forced to make a decision about how to face death. I chose life, in the sense that I came to appreciate the small moments of rupture and revolution, the seeds of the spirit that broke through the pain and hardship. I will never forget the one time I was in great pain wrapped in covers on my hospital bed, and I all of a sudden had this urge to pray. I don’t know where it came from! I neither really knew how to pray, nor whom I would be praying to. My illness didn’t magically heal, but I felt the power of something or someone holding me up, giving me the strength and courage and resilience to push on. “Maybe that’s God,” I thought to myself, intentionally leaving the question open. It was a question that I would carry with me for many years, and one that I continue to live with to this day. 2. What inspired you to found The Sanctuaries? After flirting with a career in international politics, I came to realize that institutions are only as humane as the people behind them. So I decided to devote my life to supporting the people behind them — empowering people to live as their best selves. I sought graduate training in religious pluralism at Harvard Divinity School, and was ordained as a Unitarian Universalist minister. At the same time, I quickly realized that our inherited forms of organized religious community needed to shift to catch up with the changing realities of what it means to be a younger person in the economic context and cultural worlds that we find ourselves in. As an artist and activist, I found this to be even more pronounced within circles of creative and conscious people, who too often described organized religion as something that burned or bored them. Let me be clear: I have deep respect for more traditional religious communities. Nevertheless, there is an ever-growing population of younger people who do not feel connected to or well served by these institutions. And so, I felt that we needed to broaden the bandwidth on what a spiritual community could look like. Towards the end of 2012, I spent six months meeting with people — at cafes, bars, gallery openings, music shows, and everything in between. I wanted to know what type of community they would value, what would be worth their time, what was missing in their lives. The Sanctuaries was born in 2013 as a collective response to those questions. People told me that they sought a community that truly reflected the racial and religious diversity that exists in this city, and an opportunity to build lasting friendships with people they otherwise wouldn’t meet. 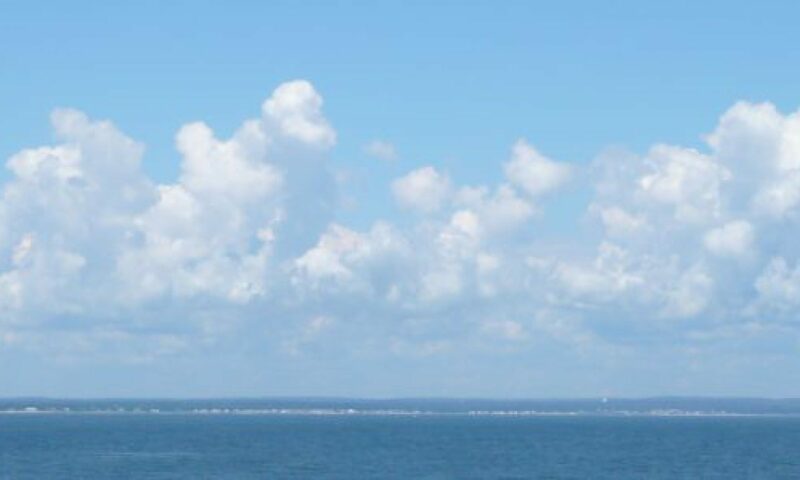 People also told me that they yearned for a spiritual community that would welcome them as they are, without drama or judgment, and that would celebrate their questions, curiosities, and doubts. It would be a place where devout Muslims and committed Christians could grow spiritually alongside people who do not claim a specific tradition, but who still strive to live a life of meaning and purpose. Lastly, people told me that they wanted to help build a creative community that encouraged personal creative expression and artistic collaboration, across mediums, in service of a higher cause. A place where art and soul fuel social change. 3. So what does this work at The Sanctuaries end up looking like? The Sanctuaries hosted more than 60 gatherings last year. One highlight was being invited to perform at the Parliament of the World’s Religions in Salt Lake City, a gathering of over 10,000 people from around the world, last fall. Another highlight was working with fifteen of our artists of diverse racial and religious backgrounds to record a seven-track album, “The Mixtape,” that sold out its first pressing. The album fuses hip hop and soul with folk and classical Indian ragas, incorporating spoken word poetry, thumping beats, soaring vocals. It’s raw, and sacred. 4. Where do you see The Sanctuaries heading next? We’re about to launch our Collective, which will equip engaged citizens to harness the power of their creative and spiritual lives to promote social change in their own communities. We’ll host a three-month pilot this spring, free of charge, where ten creative people of diverse backgrounds and mediums will form a community, and receive studio space and supplies, tools for deepening their spiritual voice and artistic craft, and the opportunity to learn from and contribute to a local justice campaign. Applications are open now and will close on Friday, January 15th. The Collective is part of our larger mission to bring new perspectives to the social problems that we face. The world desperately needs creative leaders of diverse backgrounds who are spiritually grounded and socially conscious. 5. What do you think makes this kind of community powerful for those from younger generations who have no interest in traditional religious institutions? The Sanctuaries is an unapologetically inclusive and relevant community. It’s real and raw — a space to creatively explore what organizer Osa Obaseki, Co-Founder of our Collective, calls “spiritual gangsta shyt.” There’s an appreciation for the wisdom of ancient traditions, alongside a desire to figure out what it means to live well in the here and now. Members of our community often tell me that this is the first community they’ve found that welcomes their whole selves — the creative and the spiritual, the questions and the convictions, the successes and the shortcomings. We don’t need to look alike or think alike to love alike. Let me also say: partnership is powerful. It’s a form of support without suffocation. It’s a way to mutually commit to a shared cause, and collaboratively work towards a shared vision. I prize the partnerships we have with local religious institutions, as well as with small businesses, arts organizations, and justice campaigns in the area. They don’t try to do what we do, and we don’t try to do what they do. Rather, we share stories, learn from each other, find ways to share resources and celebrate shared successes. I truly believe: we’re better together. 6. How do you think growing up in an interfaith family helped to form your approach to religion and the world? My family taught me to appreciate difference and embrace contradiction. Sometimes you can’t come to a resolution that pleases everyone. Sometimes life is just too complicated for easy answers. Rather than fight these impasses, I’ve learned to welcome them. So often, finding an answer closes down curiosity. It stops a journey of inquiry, and sends everyone home, puffed up and proud. Points of difference, on the other hand, open up new questions and demand new perspectives. They force us to look at things differently. They stretch our minds. They expand us. That’s not to say that answers are unimportant. They’re guideposts along the journey. But growing up in an interfaith family, I came to know a God who refuses to be put into a box, to be mobilized to reinforce our sectarian divisions, to be reduced to our human prejudices. 2014 song and video by The Sanctuaries, DC. When I was in my twenties and thirties, I did not expect to ever want or need a rabbi in my life again. After years of defending my Jewish identity as the child of an interfaith family, I thought I was done with Jewish institutions and clergy. I joined a community created by and for interfaith families, filled with families that spurned religious dogma, labels, and litmus tests. And I was happy. And then, Rabbi Harold Saul White swept into my life, like some kind of mystical wind, simultaneously fresh and ancient, revealing a new way to connect back to Judaism. Here was a rabbi so radical, so confident, that he was willing to become the spiritual advisor of a community of interfaith families—and share leadership of this interfaith community with Reverend Julia Jarvis. He worked with ministers and priests, marrying generations of interfaith couples, and welcoming their babies, and helping their children come of age, and conducting their funerals. Rabbi White helped families to see Judaism as inclusive rather than exclusive, decades before most other rabbis understood the importance of this work. This rabbi, who was already old and wise in years when I met him, but perennially young in his iconoclastic spirit, convinced me that I still needed a rabbi as a counselor and friend. He restored my confidence in the idea that a rabbi could be relevant, even essential, to interfaith families like mine. In his final decade, as Spiritual Advisor to the Interfaith Families Project of Greater Washington, Rabbi White preached most weeks at our Gatherings, lavishing on us his tremendous erudition, based on his studies with Abraham Joshua Heschel and Martin Buber and Mordecai Kaplan, and on his forty years as the Jewish chaplain at Georgetown University, and on his work in the Civil Rights movement. He gave brilliant sermons on the Days of Awe and Sukkoth, on Passover, on Shavuot. And he gave brilliant sermons on the Jewish roots and resonance of Advent and Christmas, Lent and Easter. And now, I am left with a strange and frustrated longing to hear the Rabbi’s own inevitably brilliant thoughts on the idea that his irrepressible energy shifted into some new form at the moment of his death yesterday. Me: Eyes wide. Mind silently blown. 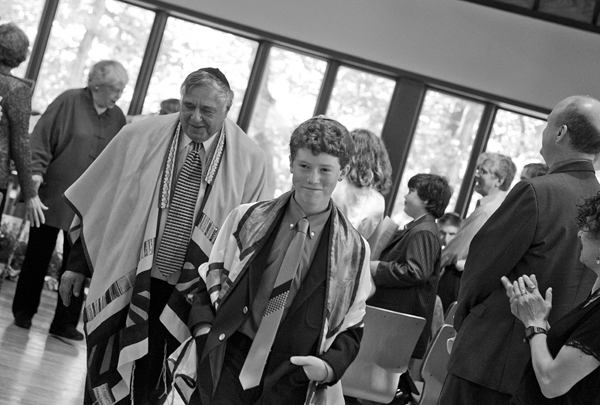 In his last years, Rabbi White had an octogenarian exterior and the wild soul of a youth. He impressed my teenagers by wearing his black velvet opera cape on Halloween and Purim, and bragging about traveling the world, and staying up all night at parties. When my son had trouble relating to his Torah portion from Leviticus, Rabbi White completely re-framed the text for him as a compelling call to environmentalism. He was honest with young people about his own atheism in adolescence, and his longstanding contempt for most institutions. And when he retired from us last spring, we threw an ecstatic second bar mitzvah celebration for him, featuring his favorite Catholic gospel choir. Like so many others, I cherished this singular and compassionate man. When he was laid up, I brought him matzoh ball soup and admired his beloved cats. I nominated him for the Forward’s list of Most Inspiring Rabbis. 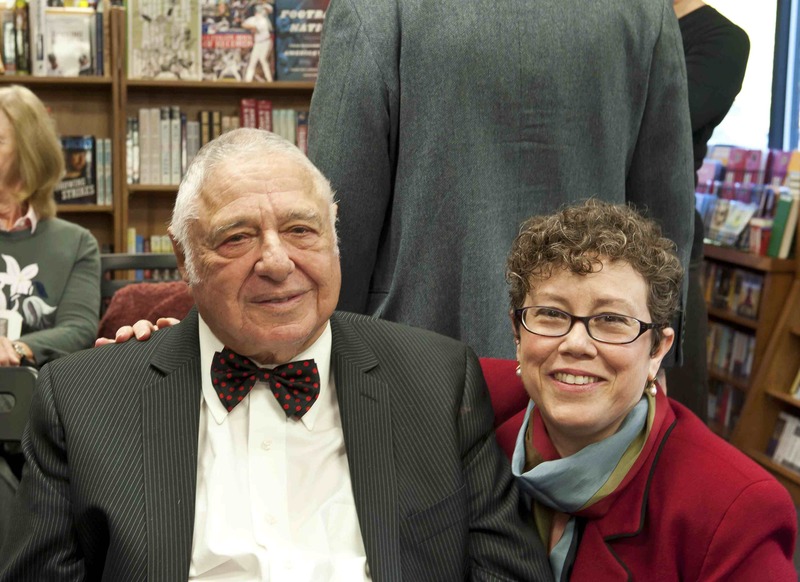 And over the past two years, as I traveled the country to speak about Being Both: Embracing Two Religions in One Interfaith Family, I had the privilege of appearing alongside Rabbi White, who is featured in the book, and who was happy to serve as my occasional wingman (or was I his?). 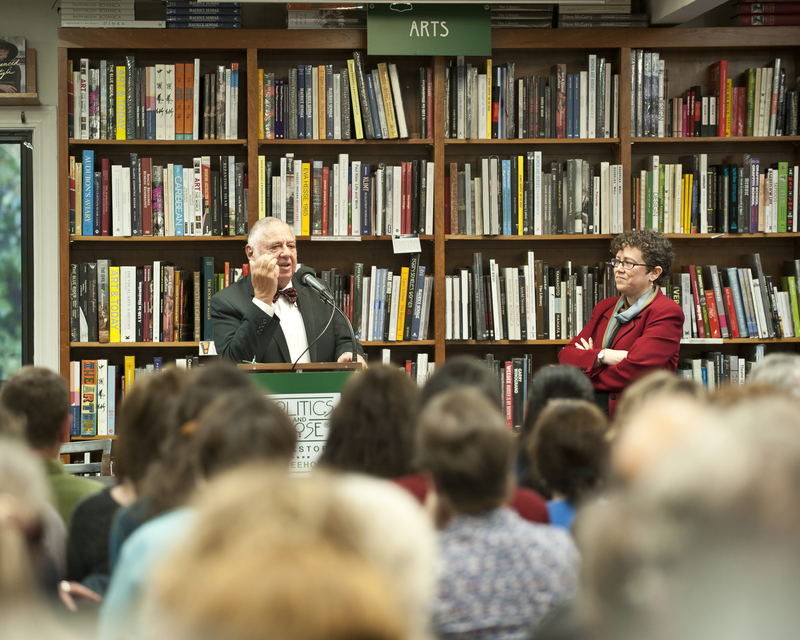 At the book launch at Politics & Prose, he wore a bow tie and told stories from his life, lending his authority and experience. And when I was invited to speak to fifty rabbis on retreat–an intimidating prospect–Rabbi White went with me and we presented our work in conversation with each other. Through Rabbi White, I allowed the possibility of rabbis back into my life. I am radically amazed to realize that I now have a whole posse of rabbis I can call friends, advisors, and colleagues. They include Orthodox, Conservative, Reform, Reconstructionist, Humanistic, Jewish Renewal, and post-denominational rabbis, all seeking to help interfaith families stay connected to Judaism (whether or not those families also stay connected to other religions). I am launching my son and daughter out into a world filled with rabbis who will embrace them as they are. But my children will always carry with them the great blessing of the memory of their first rabbi, the one who paved the way for all those other rabbis, the one who can never truly be replaced: Rabbi Harold Saul White. Shofar blast! The Days of Awe (the Jewish High Holidays) begin early this year. Rosh Hashanah starts on the evening of September 13th, and Yom Kippur on the evening of September 22nd. Autumn sends many interfaith families in search of a spiritual home. Jewish communities are becoming more inclusive and welcoming to interfaith families, with the help of national programs like the new #ChooseLove campaign. And at the same time, independent and intentional interfaith communities for families practicing and teaching both Judaism and Christianity are growing. To connect with other families in your area celebrating both religions, you can now join the Network of Interfaith Family Groups. The High Holiday services these interfaith family communities provide, or the Jewish services they attend as a group, are not a mixture of the two religions. They are traditional services, chosen or designed to be as welcoming and inclusive as possible, and celebrated by interfaith families together as a group sharing profound respect for both religions. In New York, intermarried couples first designed their own High Holiday services led by interfaith families in Manhattan in the 1980s, and those services continue today. Now, families from the Interfaith Community affiliated programs in Manhattan, Long Island, Westchester, Orange/Bergen/Rockland Counties, Danbury, Connecticut will gather for the holidays both at their own events, and with local Jewish communities. The Long Island Interfaith Community meets at a unique Multifaith Campus (Muslim, Jewish, Interfaith, and Christian communities all sharing space). They will have services for both Rosh Hashanah and Yom Kippur. In Chicago, Jewish and Catholic families have been teaching children both religions since 1993. In downtown Chicago, families from the Interfaith Family School gather together at local synagogues for the High Holy Days. 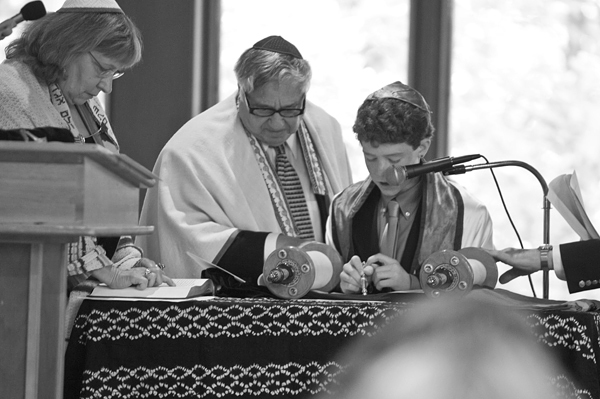 This year, Rabbi Allen Secher, the beloved original rabbi affiliated with the Family School, will be returning to Chicago to lead services at Makom Shalom, the Jewish Renewal synagogue he founded, where many interfaith families will gather to observe the Days of Awe together. In the Chicago suburbs, many interfaith families from the Union School for Interfaith Families, and the Interfaith Union, will gather in Mount Prospect to worship together with Congregation Am Chai. In Washington DC, my own community, the Interfaith Families Project (IFFP), is celebrating its 20th anniversary this year. IFFP now hosts five progressive High Holiday services, specifically designed by and for interfaith families, led by our new rabbi, Rabbi Rain Zohav. We also have two separate Children’s Services (on the mornings of both holidays). And in the Philadelphia area, the Interfaith Families of Greater Philadelphia, founded by an IFFP family who moved to Philly, will again celebrate Rosh Hashanah this year with an apple-picking trip. Growing up, my family always went apple-picking on Rosh Hashanah, to usher in the sweet New Year. Each fall provides a new chance to connect with other interfaith families, to begin religious education for your children, to discover or rediscover the beauty of the Jewish holidays. 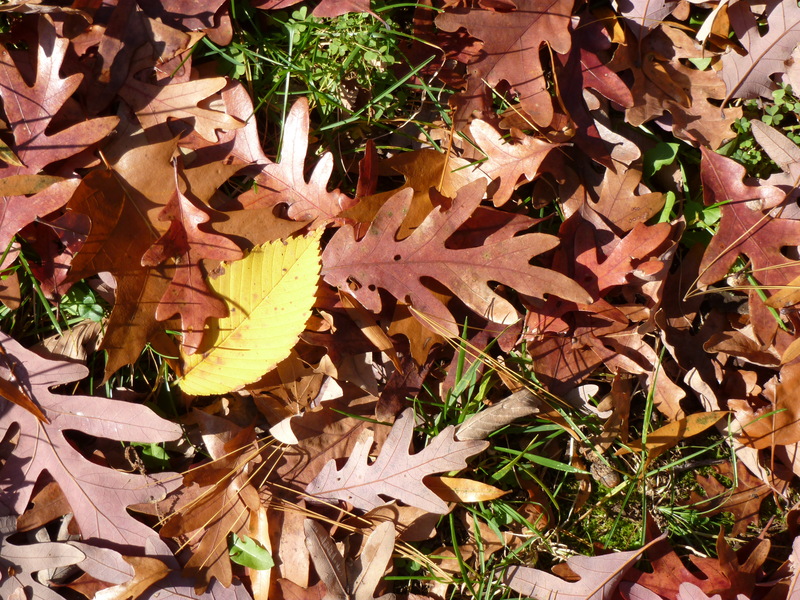 As the days grow shorter, return, renew, rejoice in the many options for interfaith families.